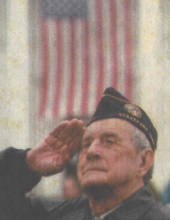 Nicholas Reut, age 101, of Stratford, died Tuesday, February 5, 2019 at the VA Hospital in West Haven. He was the husband of the late Nancy Reut. He was born on June 22, 1917 in Manhattan, NY to the late John and Julia Reut. Nicholas worked for the U.S. Postal Service on Middle Street in Bridgeport for 37 years and was on the Bridgeport Post Office Federal Credit Union’s Credit Committee and Board of Directors. During his employment he served in the U.S. Army from 1941 to 1945. Nicholas served honorably in the Philippines for the 43rd Infantry Division during WWII. He earned four Bronze Service Stars, one Good Conduct Medal, the American Defense Service Medal, and the Phillipine Liberation Ribbon with one Bronze Service Star. He was also awarded the Connecticut Veterans Wartime Service Medal. He was a lifelong member of the Veterans of Foreign Wars, the Disabled American Veterans, and the Holy Ghost Veterans. Nicholas is survived by his sons, Anton B. Reut and wife, Katarina, of Virginia, Nicholas J. Reut and wife, Pauline, of Florida, and Gregory Reut, of Stratford; his grandchildren, Jennifer Reut, Anton Reut, Nicholas Reut, Stephanie Reut, and Rachel Sherwood; his great grandchildren, Nola Reut, Niccolo Reut, Ava Reut Richards, and Vaughn Reut; several nieces and nephews; and his sister, Mania, of Ukraine. Friends are invited to attend the funeral on Wednesday, February 13, 2019 at 9:00 am at The Pistey Funeral Home, 2155 Main Street, Stratford and at 10:30 am at Holy Ghost Russian Orthodox Church, 1540 E Main Street, Bridgeport with Rev. John Jillions officiating. Interment will follow at St. John’s Cemetery, Stratford. Friends may call on Tuesday from 4 to 8 pm at the Pistey Funeral Home. Please visit www.pisteyfuneralhome.com to express condolences. To send flowers or a remembrance gift to the family of Nicholas Reut, please visit our Tribute Store. "Email Address" would like to share the life celebration of Nicholas Reut. Click on the "link" to go to share a favorite memory or leave a condolence message for the family.